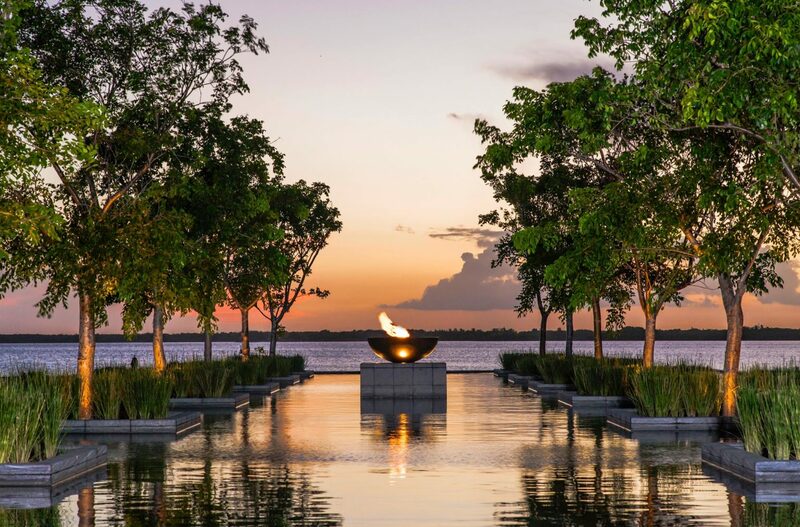 Sunset at the photogenic reflecting pond, Nizuc Resort & Spa. Here at Destinations, we’re conscious that places aren’t experienced in isolation: it’s about the journey, too. In the first of a four-part series exploring Mexico’s Yucatan Peninsula, we relax among environmentally-sensitive design elements at Nizuc Resort & Spa and explore Punta Nizuc’s underwater museum. The best way to come back to life after a harrowing day of long flights and car rental negotiations is a swim. I reach for my swimsuit before realising that’s not necessary, here at my secluded private Garden Pool Villa at Nizuc Resort & Spa. Stepping into the pool, the waist-height water temperature is just right: refreshing but not shockingly so. I listen to faint echoes of the sea beyond the solid stone walls of the villa, and the feeling of rock underfoot has me reflecting on how grateful I am to be back on solid ground. A small traditional Maya figure overlooks the pool area, while perfectly-raked sand paths give the feeling of a Zen garden. Oversize lanterns light the space, and I can make out the giant stone blocks of the façade. Returning inside, I flick a switch and the lights come up slowly — theatrically — revealing the anatomy of each lightbulb. Maya carvings dominating the wall behind the bed are another nod to the local culture, its epic nature reflected in the sense of scale in this structure: everything is oversized, from the doors and the high ceilings to the headboard, floor tiles and window louvres. Sparse, well-chosen décor lets the space speak and connects it to the surrounding environment. Lamps with sculpted rock bases recall the pillars of the ruins all over this region. Natural wooden furniture is crafted of rescued mangrove trees, which were cleared from the nearby canal to keep their counterparts alive and kicking. 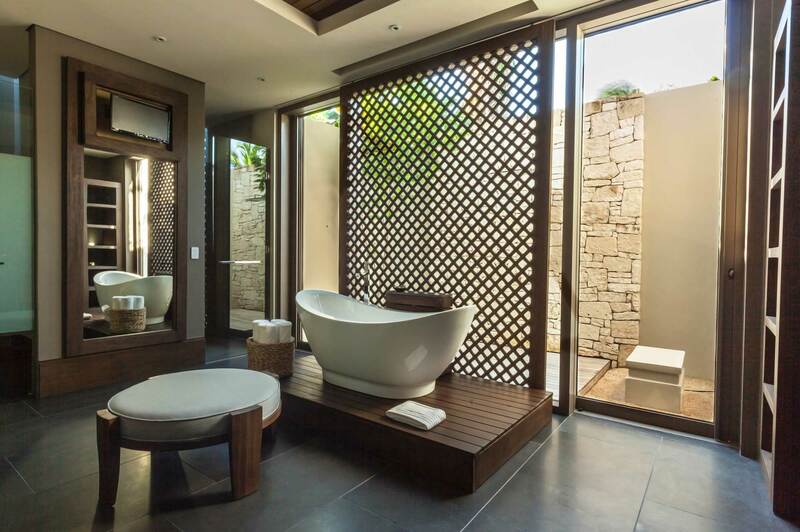 Driftwood adorns the bathroom and chic outdoor lounge, while vintage suitcases sit atop ample cupboards. This all makes sense once I learn that the resort was dreamed up in its entirety by interior and architectural designer Alejandro Escudero. Every detail — from the structures themselves to the furniture and artwork — has been conceptualised and designed as part of the whole, and it shows. The bed is that perfect blend of support and cushion that denotes quality. It’s the same with the sofas: I am surprised to sink in, not expecting such comfort from this degree of design — it’s usually one or the other. Come morning, I open the wide louvres to the pool area and let the sun and birdsong filter in, soon switching soundtrack to the substantial flat-screen’s reggae station. Warming up to the day, I head to the bathroom — a hangout area unto itself with a curvaceous bath, separate shower, and even a circular sofa bed. Mirrors — giant ones, of course — accentuate the spaciousness. Light filters in through a lattice screen, and water flows like a waterfall from the designer faucets. However, I join the birds, opting for the dual outdoor rain shower. There is plenty of resort to explore here. Opening out from the lobby, Nizuc’s already-iconic reflective pool is a spectacular centrepiece: ambling to breakfast at Café de la Playa, I can’t help but stop for the compulsory photo op. Arriving at the Café, I’m pleasantly surprised: resort buffets are often predictable, so one becomes accustomed to the usual suspects. Those are there too, in great quality and quantity, but the incorporation of local cuisine: dainty gorditas, the slow-roasted pork of cochinita pibil, and kastakan — occupying the middle ground between chicharrones and carnitas — sets this breakfast apart. An ideal spot for a margarita: Bar A-Kan, Nizuc Resort & Spa. And then there are the bars: Bar A-Kan is the ideal location for an afternoon margarita, while, come evening, Bar Havana is the place to be, with live music and even cigar rolling sessions. However, if there’s one thing in life I can’t resist, it’s a swim-up bar. Reluctantly clambering out of my comfy cabana, l step onto smooth black and green tiles and feel around for the bar stools lurking beneath the surface. I settle in for a potent pina colada, looking out over the edge of the infinity pool to see families exploring the nearby reef. It’s possible to walk in from the beach, though the nearby jetty provides an ideal jumping-off point, with needlefish visible from above in the clear water. Soon enough, it’s time to depart for my visit to the Museo Subacuático de Arte (MUSA), the nearby underwater museum initiated by the director of the region’s marine park, Jaime Gonzalez Canto, and British sculptor Jason Decaires Taylor. The drive from the resort to the Aquaworld pier takes me past monstrous all-inclusives and structures that could generously be termed ‘fixer-uppers’ or ‘modern ruins’ — remnants of Cancun’s heyday, and confirmation that I’ve made the right choice in Nizuc Resort & Spa. On entering Aquaworld’s HQ, I’m directed from the front desk, into a small swim store, and outside to the pier. The Paradise shuttle soon pulls up, music pumping. 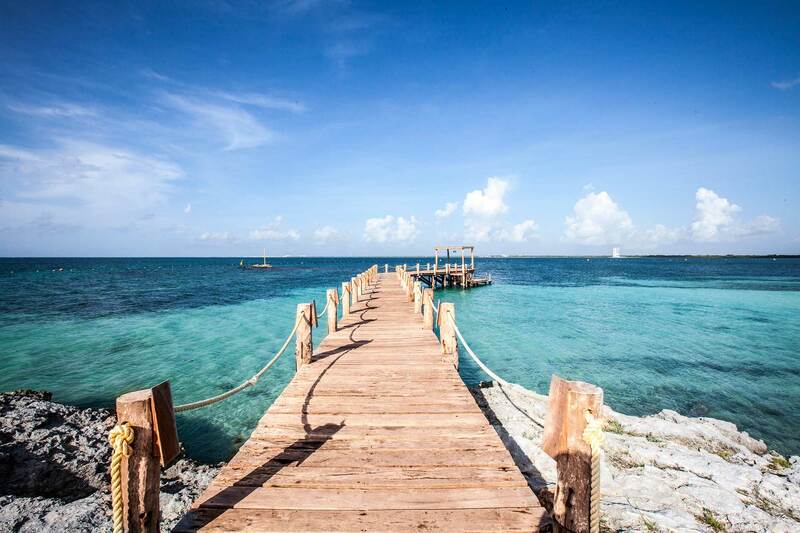 The long pier at Nizuc Resort & Spa overlooks crystal water. As we make our way out of the marina, the boat’s speed increases, along with the BPM. I enjoy a cold tap beer as we pull away from resorts and along the mangroves, a reminder that this place could be nothing but swamp without substantial human intervention. We pass locals swimming and snorkelling under a bridge before veering left, where the resort comes into view. From here, I can take in the full picture, its low buildings, thatch roofs and earth tones much more sympathetic to the landscape than its Cancun counterparts. 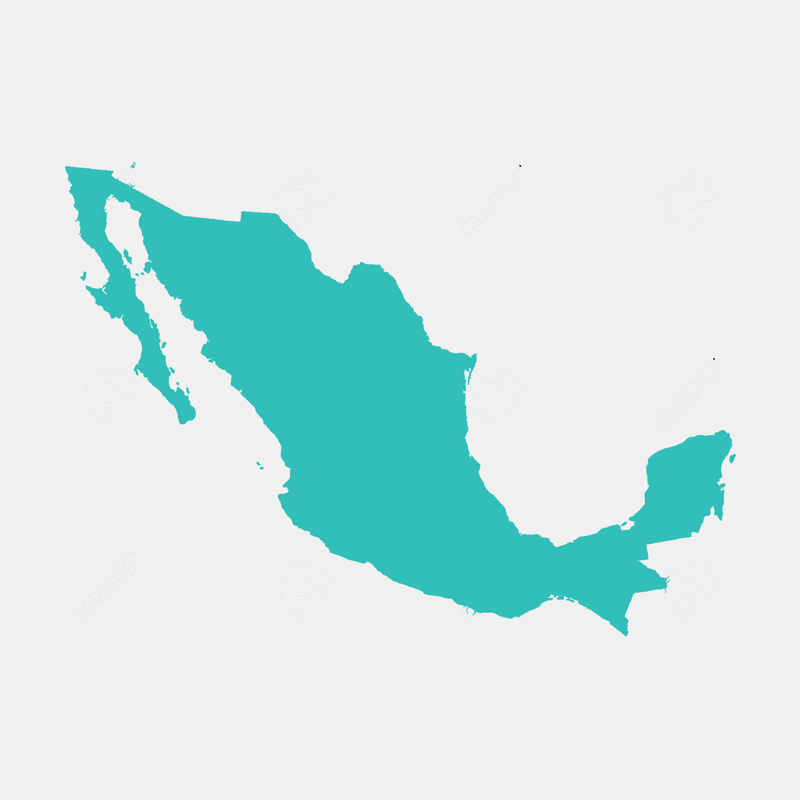 There are two sites to the museum: one here at Punta Nizuc, and another, larger group of sculptures off Isla Mujeres, around 40 kilometres north. There, the sculptures are 8 metres below the surface, so are best seen on a scuba dive, while here, at just 4 metres deep, they are ideal for snorkelling. The boat makes a quick stop to drop families off to the SubSee, Aquaworld’s ‘yellow submarine’. A cross between a sub and a glass-bottomed boat, this offers a drier way to see all of the area’s attractions. No such copout for the rest of us, though. 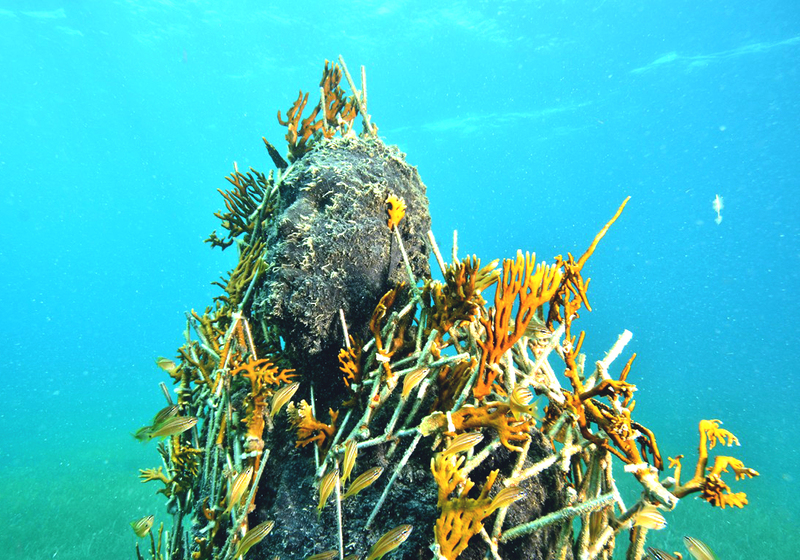 A sculpture at MUSA Punta Nizuc creates an artificial reef . Once on board Aquaworld’s pontoon, we receive some introductory information from Javier, who is to be our guide for MUSA. He outlines the rules: we’re to follow him with the buoy, and though lifejackets might not be cool, they’re necessary, “even for scuba divers and Michael Phelps.” We’re fitted with gear, plunge into the water, and soon see why these warnings are necessary. Following Javier’s lead, we battle against the tide, hunting for the museum below as soft corals wave in the strong current like trees in the breeze. The currents affect which artworks can be visited on any given day, though the guides strategise around this as much as possible. Sculptures created by Decaires Taylor and five other artists slowly come into vision out of the haze. Perhaps influenced by the location, there’s something eerie, solemn, and even a little dark about the works. Elier Amado Gill’s Understanding features six figures seated pensively around a large rock said to symbolise Cancun, evoking a sense of meditation and guardianship, while Sin Titulo represents a weary male figure, his fingers pointed at his temple like a gun. Both by Decaires Taylor, Inertia presents a living room scene on the seabed, an obese man slumped on a sofa, staring blankly at a TV, plate in his lap, and Time Bomb is, well, a cartoonish bomb. 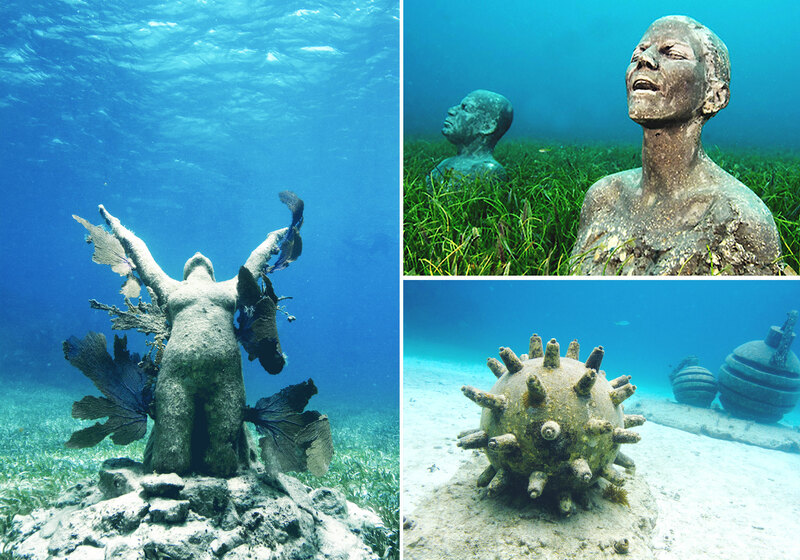 Jason Decaires Taylor sculptures at MUSA, Punta Nizuc. Clockwise from left: Reclamation, The Anchors, Time Bomb. It’s not all bad news though. In Decaires Taylor’s Reclamation, a woman kneels, head turned to the sun and arms outstretched as if in the process of morphing into an angel, coral growing out of her ribs like wings. This confluence of coral and concrete is an integral aspect of the museum’s mission: while on the one hand, the park is designed to draw visitors away from areas of local reef damaged by hurricanes and humans to allow them to recover, small holes in the sculptures also encourage coral growth, creating an entirely new artificial reef. In addition to revealing the pun behind Decaires Taylor’s Holy Man, this means that along with the art, there is plenty of wildlife to see. Fish swim between the legs of human figures, a big barracuda lies in wait for prey, and a sea turtle grazes on the seafloor. Back at the boat, Javier and the other guides regale me with stories of the creatures they’ve met, human and otherwise. They emphasise the importance of people seeing the destroyed reef, so as to know exactly what is at risk. After another refreshing beer, we re-embark the shuttle and retrace our steps. Speed boats do what they do best, speeding past us, and a private yacht dominates the canal. People smile across from fishing boats. I notice the birds in the mangroves — a white one so still he looks like another statue. 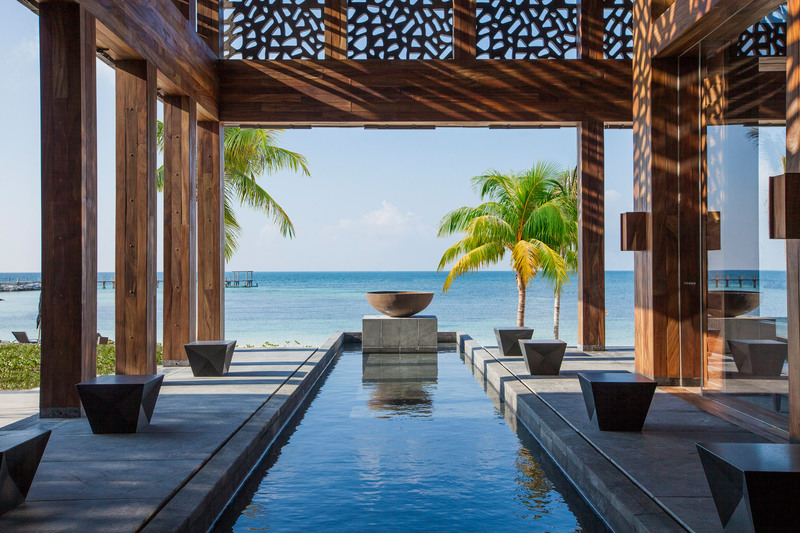 Cancun may well have had its day, but properties and initiatives such as Nizuc Resort & Spa and MUSA suggest that — just like the reef itself — a resurgence could be underway. For now, though, I leave the unsightly hotel zone behind me, and drive off — literally into the sunset — towards my next, more remote destinations to the north: Isla Holbox and Rio Lagartos.